When MADtv first hit the FOX airwaves in 1995, it breathed fresh, new comedic life into prime-time television. 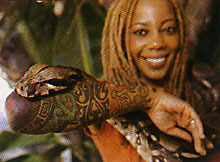 One of its most popular actresses, Debra Wilson (now Debra Wilson Skelton) kept audiences rolling on their living rooms with her over-the-top impressions of Oprah Winfrey, Whitney Houston, Condoleezza Rice and other well-known public figures, as well as a few unique characters like "Melina", a tough Latina teenager, and Bunifa Latifah Halifah Sharifa Jackson a high-maintenance lady with an attitude. A South Ozone Park (Queens) native, the comedienne proudly refers to herself as Mrs. Skelton, having recently married "her perfect, beautiful husband," screenwriter Cliff Skelton. She's lived in Los Angeles now for almost a decade, working on a variety of television and movie project, including her current role "TV Watercooler" on the TV Guide Channel every Monday night. In addition to her husband, the actress shares her life home with 15 year-old boa constrictor, Lizzie--who has her own loft space--and two cats, Nala and Tabatha. New York Tails: So you're a newlywed! Congratulations! Debra Wilson Skelton: We've been married for three months. Cliff is a director and screenwriter from Vancouver, Canada. He'd written a character just for me for a movie called "Data", a futuristic horror-thriller, after seeing me on MADtv. I read the screenplay and loved it, so he came to L.A. to talk more about it. I knew from day one he was going to be my husband; it took him about two weeks to realize the same thing. NYT: Describe your journey as a kid from South Ozone Park, Queens, to where you are today. DWS: I started singing in church at an early age and I did a church play, but my first real theatrical experience was at the High School of the Performing Arts. After college I worked for the City of New York Parks and Recreation Department as a Recreation Specialist, but at the same time was part of an 'improv' comedy group; there weren't a lot of Black women in comedy improv then. I learned so much being part of the group and the most two important rules of improv: "Yield" and "Don't Deny." DWS: Yes, and I became one of the longest-running members of the show, soon to be followed by current cast member Michael McDonald. MADtv was a wonderful, challenging experience, both professionally and personally. I learned so much about myself, my craft, and human nature, just dealing with so many people on so many levels; anything after that was just pure fun. NYT: You outrageously portrayed some of mainstream culture's most recognizable people in an on MADtv. What inspired you, and did any of them ever call you and say, "Hey! What's up with that?" DWS: It's interesting when you do impressions of well-known people--and they are impressions, as opposed to impersonations, because an impression means it's [my] opinion. Once you start doing an impression of a well-known person you're doing a revolving study of them, because they're living, breathing people. No, none of them ever called me to complain. Oprah Winfrey has enough money to have me killed but she doesn't want to stain her reputation with that. And Whitney Houston would just beat me up-she's the only one I'm afraid of. NYT: What about the more "composite" characters you've portrayed, like 'Bunifa Latifah Halifah Sharifa Jackson' and 'Melina', who are based on over-the-top Black and Latina stereotypes, respectively. Did you ever feel like you were pushing the envelope with such characterizations? DWS: I never pushed the envelope far enough with those characters! They were so outlandish you can't help but recognize parts of someone-or even yourself-in them. NYT: Tell us about Lizzie, your Columbian Red-tailed Boa Constrictor. DWS: I adopted Lizzie about nine years ago to be a companion to my male snake, Victor, who unfortunately has since passed away (at the age of 19). Lizzie got pregnant, and I didn't know nothin' about birthin' no snake babies. She gave live birth to 28 snake babies, and I midwifed! Within six hours they began to hiss and strike at me-these aren't kittens. I gave them to a friend of mine who has a reptile pet store and who I trusted to find good homes for them. I visited my "grand-snake-babies" and even handed out birth announcements. Lizzie is about 15 years-old now. NYT: Do you have advice for people who may want to get an exotic animal just to be 'different'? DWS: Don't do it. If you're doing it just to be cool, don't do it. Having a pet is never about yourself; it's about the love, affection, dedication and care you can give another living thing. If you don't put that first, you've put yourself last. Instead, do the research and the homework each individual exotic pet requires. Having a snake is very much like having a dog; it's very similar to cleaning up after a dog and requires a lot of care. DWS: People sometimes get pets as an ego thing, but I don't think you should have an animal just as a conversation piece. Some people get pets that will show them affection, but I have a husband, family and friends for that. I wanted to take care of an animal and give it a healthy life without it owing me a thing. I just wanted to do a random act of kindness with nothing expected back in return. But I found snakes have personalities just like every other animal. My perfect, beautiful husband also takes great care of her. As for Solomon [her scorpion] I was curious, but deathly afraid, the first time I saw him. But I stood with him for three hours, and even held him. And there I was, thinking, I'm holding a scorpion! I became fascinated with their care. Giving them a good quality of life was a source of fascination and joy. Sharing an exotic animal with others is also a joy. Everyone you share them with comes away with a new way of thinking, understanding, and appreciation. They can walk away getting over a fear, or at least have a new awareness, of the animal. My mother, for example, always thought snakes were disgusting. But three years ago, she saw me giving Lizzie a bath and she asked if she could touch her. It was one of the proudest moments in my life. She still doesn't like snakes, but she took a step forward. It was a powerful bonding moment in our relationship because she's the one who brought it up; I never try to force or push learning on people. I took pictures of her with the snake; they're my favorite pictures in the universe. My family (mom and dad, two brothers and two sisters) are proud of me for just being a healthy, loving, creative member of society that is charitable and spiritual. You don't need to be famous to do that. Or rich to do that. You just need the desire to be a loving, healthy, human being and have respect for other life forms. NYT: Planning to add any more exotic members to your family? DWS: I would love to have a Savannah Monitor (a lizard that can get reach up to six feet long.) I would dress him up for the holidays. I want to be the crazy cat lady but with lizards. But I think I'll wait until I'm 60 to do that. Then people will think I'm really crazy. They'll say "there goes that crazy tattooed lizard lady again." If I can accomplish that in my lifetime, I have truly lived. In addition to her commentary and reviews on "TV Watercooler", Debra Wilson Skelton is busy doing voice-over work for animated shows like "The Boondocks" and other shows on the Cartoon Network. She is also in the film, "If I Had Known I Was A Genius" with Whoopi Goldberg, Sharon Stone, Keith David and Della Reese. She narrated "101 Sexiest Celebrity Bodies" for E! and is the narrator for an upcoming Animal Planet special, "The World's Ugliest Dog", based on the famous contest held at the Sonoma-Marin Fair in Petaluma, California every year.